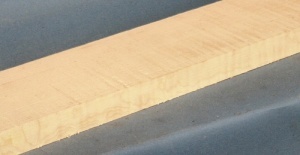 Ripple sycamore guitar neck blank type A first choice strong ripple. Acer pseudoplatanus sourced from England. A fine textured stable and strong timber with a long history of use in Guitar making.